https://cdn2.hubspot.net/hubfs/644585/bio-whitepapers/Comparison%20of%20the%20BAM%20(multiscale%20reference)%20algorithm%20to%20other%20methods%20for%20CNV%20detection%20from%20NGS_Whitepaper%20Cover%20Page.jpg Learn more about the various methods that have been proposed to detect CNVs from NGS data in tumor-normal matched paired colon adenocarcinoma samples. Copy number variations are a significant source of genetic diversity in humans. The platform of choice to detect genome-wide CNVs has traditionally been microarray, including SNP arrays which can also detect copy neutral LOH regions. Next-generation sequencing (NGS) has advanced rapidly and is the platform of choice for sequence variants. Decreasing costs have made it much more affordable to perform sequencing and the need for deriving copy number from NGS data has been rising. There are several tools available (CoNIFER, xHMM, CNVkit, QDNA) for this but most are not user-friendly; they require strong bioinformatics expertise and use of the command line. Often each tool is adept in only one arena (e.g. cancer or constitutional samples, data from WGS or targeted panels, …). A new algorithm incorporated into Nexus Copy Number 9.0 is the BAM (multiscale reference) method. BAM (multiscale reference) functions well with both shallow/targeted sequencing data and WGS/WES with normal depth of coverage. We compare the ability to detect CNVs between algorithms and platforms. 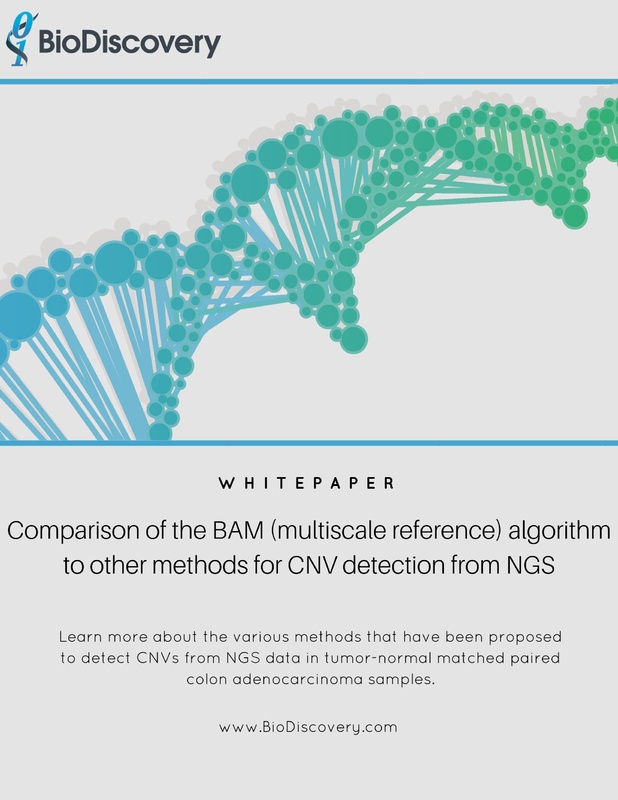 Presented in this white paper is a comparison of CNV estimation results from BAM (multiscale reference) and other methods with data from WGS(<1x), WES (30x), cancer panels, and microarray.